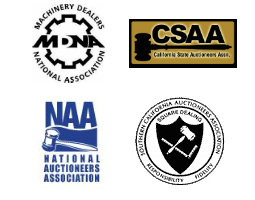 For over 20 years, AAG has been performing Auctions, Liquidations and Appraisals for all forms of Machinery, Equipment, Inventory and Real Estate on a national basis. AAG is headquartered in Los Angeles, with affiliates in Northern California and the East Coast. AAG is known as a leader in our profession for generating on average the “highest” Auction & Liquidation returns (oftentimes FAIRMARKET VALUE). This success is due to AAG having one of the largest “Proprietary” computerized mailing systems, conjoined with a client base consisting of repeat customers. AAG offers CASH BUY OUTS, Guarantees, or Commission Sale Programs. AAG has two offsite storage facilities to relocate assets (if required) and to conduct sales. AAG’s growth and success comes from its talented and devoted staff who work in close partnership with every client to achieve optimal performance, goals and expectations, combined with AAG’s proven knowledge of various marketplaces, data base of buyers, companies, end-users, and dealers on a global basis.